The Land of the Thunder Dragon, or even, the Last Shangri-La. 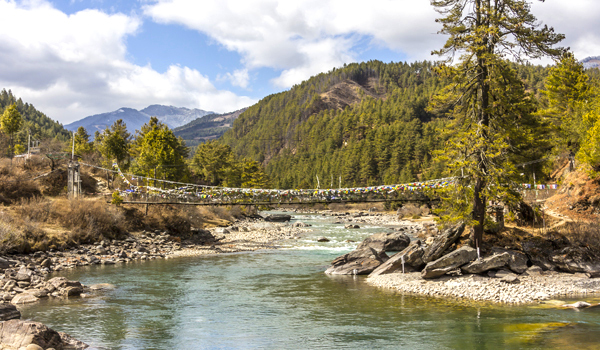 Himalayan Bhutan—once a closed-off kingdom—has long inspired travellers to wax poetic. Open to visitors from abroad only since the 1970s, the last-remaining Buddhist kingdom is wondrous and unique for many reasons. For one, “gross national happiness” is famously given priority over GDP. For another, the rugged, soaring landscape is paradise for trekkers, with stunning views from the rooftop of the world. Add in locals in traditional dress, rich, chilli-spiced food, and historic monasteries clinging to rocky outcrops, and it’s clear there are many magical things to do in Bhutan. On our Land of the Thunder Dragon itinerary, you can expect to traverse rivers and old growth forests, tour monasteries and temples, and catch glimpses of Everest and Kanchenjunga through the clouds. For those looking to truly get away from it all, nowhere will feel quite so foreign. 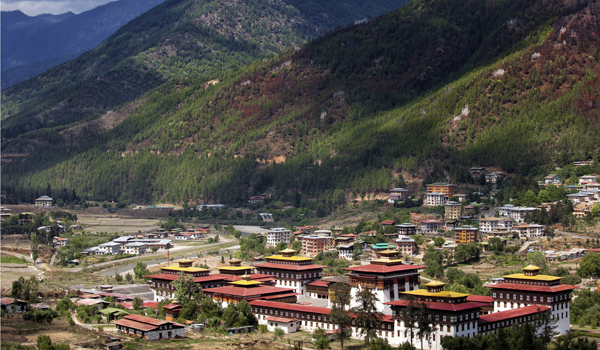 Below, we’ve selected some of the most beautiful sights to see in Bhutan. It’s wise to start any trip to Bhutan in Paro, a petite town that’s home to the only international airport in the country. Found in the Paro Valley, which meanders its way up to the Tibetan border, Paro is surrounded by awe-inspiring landscapes. 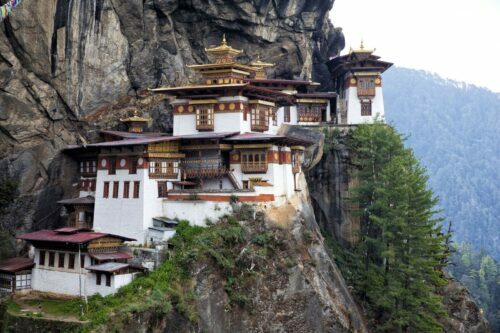 It’s also considered by many to be the spiritual heart of Bhutan, as it’s host to over 155 religious sites. 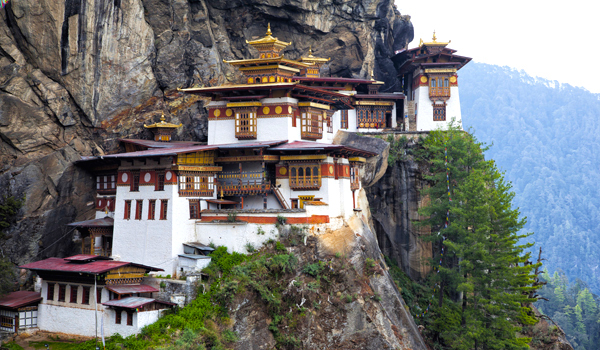 The best known of these is the Taktsang Monastery, otherwise known as the Tiger’s Nest. Dating to 1692, this historic structure is famously located along a sheer cliff wall. 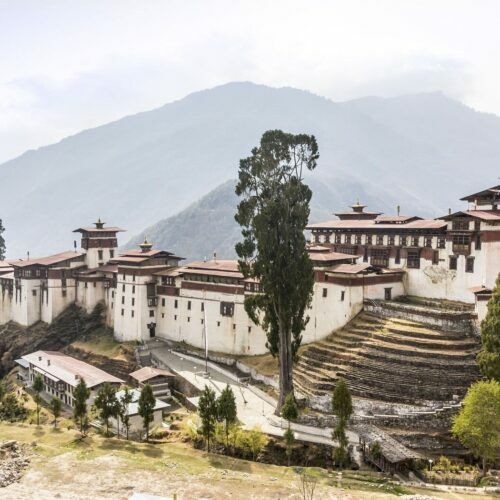 Another Paro highlight is the Paro Ta Dzong, a historic watchtower that now hosts a national museum. If you’re lucky, your visit may also overlap with the Paro Tsechu, a springtime religious festival that includes riotous dance performances. Thimphu, the country’s minute and pretty capital, also offers plenty of beautiful sights Bhutan. Hosting its own Tsechu, a beautiful mask festival, held during the autumn months, and host to a fleet of dzongs (or forts) that showcase ornate, traditional Bhutanese architecture, Thimphu has plenty to entice travellers. While you’re here, look out for the gigantic Buddha Dordenma statue, as well as a number of museums, like the Folk Heritage Museum and Textile Museum, which delve into the country’s past. Beyond its cities, however, Bhutan is largely remote – close to 70% of the country is forested, and its uniquely rugged landscapes are perhaps the biggest draw for visitors. 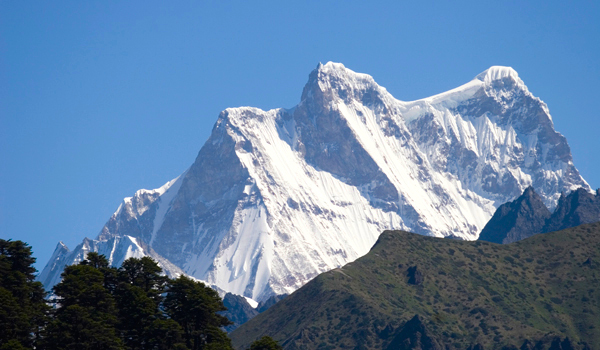 If you’re eager to trek, Bhutan is ground zero, with multi-day journeys that vary from the introductory to the truly challenging (the Snowman Trek along the eastern Himalayas, for instance, is typically regarded as one the world’s most difficult excursions). For those looking to go an adventurous trek without pushing themselves to the brink, the Druk Path is possible and, lasting five nights, accessible to those after a relatively quick trip. Treks around the Phobjikha Valley and Bumthang, in the centre of the country, are also popular amongst visitors. 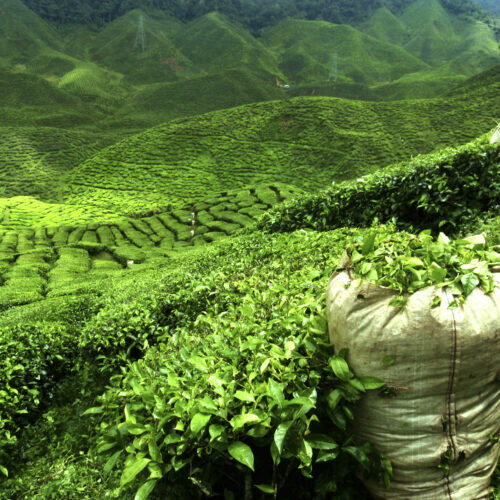 But Bhutan also offers up as much luxury as it does wild escapes. A number of high-end hotels cater to visitors seeking equal parts pampering and exploring. 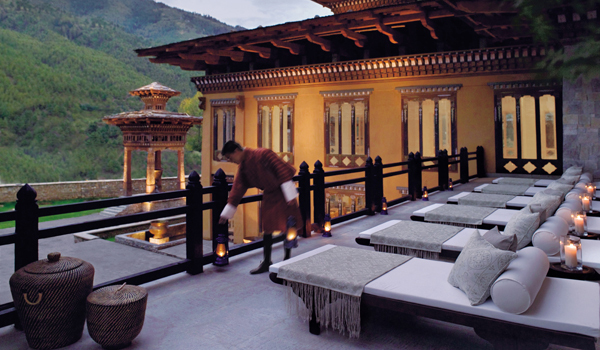 The Uma by Como hotels in Paro and in Punakha are regarded as some of the country’s finest, while the Taj Tashi in Thimphu provides an indulgent getaway. 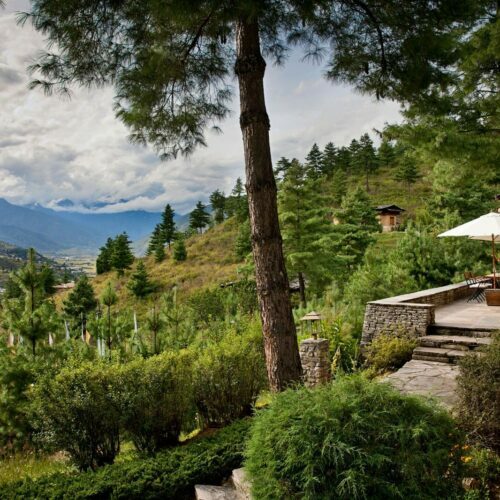 For a retreat in the heart of the country, the Gangtey Goenpa Lodge is another fine choice. Whether you’re jetting into Paro or driving up from Darjeeling, don’t miss your opportunity to discover the tucked away kingdom of Bhutan. Thanks to its unique culture and mountain views, there are plenty of things to do in Bhutan that are unique the world over.